We’ve all been there. Coach calls out 3,2,1, Go and we take off like a caged animal. For the first: 90, we feel like Mat Fraser. I’m so fit! This is awesome! Then we hit the wall. As soon as it really starts to hurt, we look at the clock—we’re 2:15 into a 10-minute AMRAP. Yikes. Great question. Here’s a little bit of science. Don’t freak out. Everyone has a lactate threshold (LT). It’s different for everybody—it depends on your level of fitness—but generally, it is between 75-85% of your maximum power. When exercising at or below this threshold, any lactate produced by the muscles is removed by the body without it building up. When you work out above it, lactate accumulates in the blood at a faster rate than it can be removed. As the unbuffered acid is added to the blood, you start to feel really bad. At this point, no amount of mental fortitude will save you. It’s biology. You have to slow down. In other words, your lactate threshold is your maximal sustainable pace. If you go faster, it becomes unsustainable. If you go slower, it’s no longer maximal. It’s the exact point at which you cannot go any faster without slowing down later. At most, you can only spend up to 3 minutes above your lactate threshold. After that, you explode. The more time you spend at or around lactate threshold, the fitter you become. Athlete 2 spent only about three minutes at her LT. Athlete 1, by contrast, spent ten minutes there. 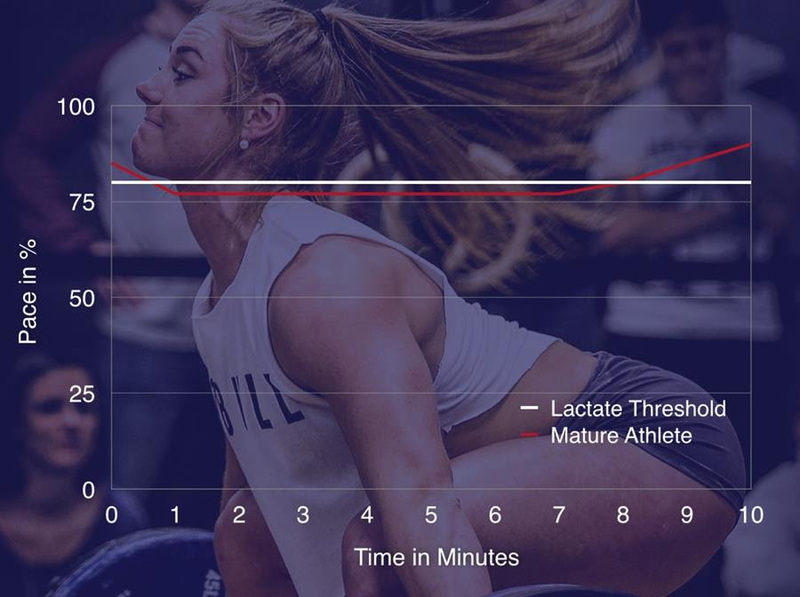 Athlete 1 got three times the desired stimulus of the workout than Athlete 2 in that workout. Not a big deal in one isolated workout, but over time, the difference is significant. Because your LT represents your fitness, the goal is to always push it higher and higher. The only way to do that is to spend time more there. By training consistently at a threshold, Athlete 1 in the above example is increasing their fitness faster than Athlete 2. Developing a sense of pace requires effort and practice. The next time you do an AMRAP or rounds-for-time workout longer than seven minutes, come out more conservatively for the first 2 minutes—aim for 80 percent of your max pace. From there, try and settle into a pace you can hold for the rest of the workout. Throughout the workout, ask yourself, “Can I go any faster without slowing down later?” If the answer is yes, kick it up a notch. If no, stay where you are or slow down. Use a buddy or a video camera to record your splits for each round to see how consistent you are. You’re not going to nail it the first time. But if you do this enough, you’ll start to gain a feel for where your threshold is. It’s worth the effort. Training at threshold is a game changer. You can go into the gym right now, no fitter than you were ten minutes ago, and PR your “Kelly” time simply because you were smarter. And if you train like that all the time, you’re going to get fitter at a much faster rate.